Until recently, there was really only one choice of CPU for a gaming PC – Intel. But with the launch of the new 45nm Phenom II chip, AMD got itself back in the game. 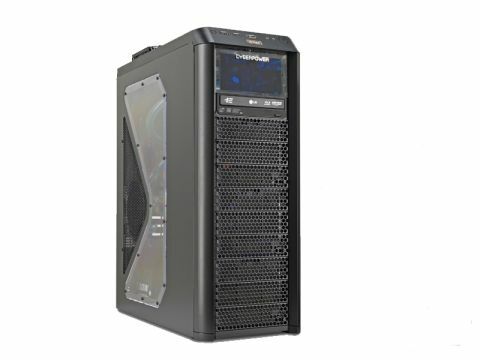 So while it's not surprising to find a Phenom II in CyberPower's latest mid-range gaming machine, the fact that it's a triple-core X3 processor might have your eyebrows twitching. However, in reality it makes quite a lot of sense. Why pay more for the X4 chip to gain a largely unused core? Instead, CyberPower has clocked the socks off an X3 for single-threaded performance and spent the rest on a better video card and cooling system. Thanks to those decisions, the watercooled Phenom II X3 720 Black Edition chip hums along at an enormous 3.65GHz, while the graphics duties are handled by a Palit-branded Radeon 4870 1GB with improved cooling and slightly higher than standard clocks. All in all, it makes for gaming performance that the Dell XPS 625 simply can't cope with.